When was Miku Expo 2014? Where was Miku Expo held? How was Miku Expo? Review of Miku Expo 2014? Miku’s network Television Debut on The Late Show with David Letterman. On October 8, 2014, Miku made her US television appearance on the Late Show with David Letterman to promote the Miku Expo 2014 event in Los Angeles, that weekend, and New York, during the following weekend. This appearance also comes a day before the show at Wallplay (a local coffee shop) and Kinokuniya Book Store in New York opens its Miku Art Exhibit. Check out Reggie’s excellent article about the Letterman appearance: https://learnmmd.com/http:/learnmmd.com/hatsune-miku-david-letterman/. One of the attractions of Miku Expo New York was the art exhibit at Wallplay. I went on the last day, October 19, 2014, the day after the concert. 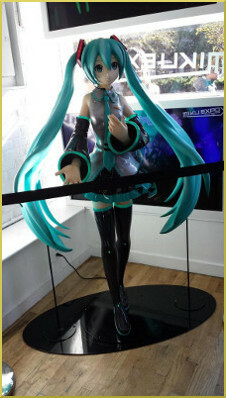 As soon as you enter the building, you are greeted by a life size Miku and off to the middle is a Miku nendroid about a foot tall. 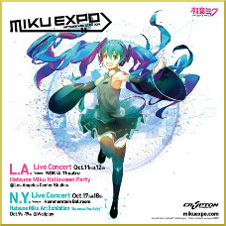 On the walls were displayed art, specially made for Miku Expo 2014 New York. The art was also available for sale in poster form upstairs. Unfortunately, at the time I went, many of the options were sold out. Also upstairs there were many figurines on display, as well as many of the software and the brief history of Miku/Vocaloids. Wallplay was not the only location in New York that did a Miku art exhibit, Kinokuniya Book Store had an exhibit of their own. It was a small area set up in the front corner of the store by the stairs to the lower level, just when you enter the store. It was easy to miss; I didn’t know it was there until a clerk pointed it out for me. Displayed on the walls were a collection of artwork from Piapro, specially selected for their Miku Expo exhibit. In the same area they had consolidated their Vocaloid and Miku items that they had for sale. From the Miku Expo website, Kinokuniya Book Store had a set of the art in post card format for sale. Unfortunately, it was sold out when I visited on October 18th, before heading to the concert. Miku Expo would not be complete without a live performance from the virtual diva herself and her entourage: Luka, Meiko, Rin, Len and Kaito. I went during the October 18th concert and I have to say it was an experience! As soon as the doors open, you go to the merchandise kiosk. Most if not all of the merchandise got sold out by the end of the concert. The concert was under 3 hrs long and featured about 27 songs and was simply amazing. The projection of Miku and her entourage was so high def that it was like they were there. Watching YouTube footage doesn’t compare to actually attending a Miku concert. It felt like how a concert should feel! There are nuances in a concert that you simply don’t get through a video … like struggling to see the stage because you are short; being in close proximity to the person beside you; arms tired from swinging the glowstick and voice horse from chanting and singing along. After the concert, we were able to meet the CEO of Crypton Future Media Inc., Hiroyuki Itoh, and be interviewed by WOWOW, the Japanese Network that was filming the event. All in all, I thoroughly enjoyed my time at Miku Expo. I especially enjoyed talking to the many attendees that were there; from the Snow Miku cosplayer and the group of University students from New Jersey, while waiting in line for the concert; to the cat girl Miku and the Japanese national who has been to most, if not all, of the Miku live events and brought his own hand made figurines to the Wallplay exhibit. For it is the people within the fandom that makes the community the way it is. This experience has made me a bigger Vocaloid fan and inspired me to be a stronger MMDer. When the next available event comes around, I would definitely attend. ‘Till the next Miku event!